Accounts of cinematic style in mainstream narrative feature films often focus upon the importance of legibility, stylistic invisibility and the primacy of narrative. Coining the term classical style, David Bordwell suggests it ‘makes the sheerly graphic space of the film image a vehicle for narrative’, shifting qualities of tone, movement and composition enough between images that the attention of the viewer is retained, but not distracted, by these changes (1985: 50). This continuity asserts that, despite and superseding any symbolic or thematically relevant arrangements of figures or compositional elements, the environment represented is first and foremost coherent and realistic. The continuity style is a mode of communication: it should not get in the way of the content being communicated. This kind of model is predicated upon a flat screen plane, and therefore its appropriateness to 3D content should be scrutinised. While Bordwell provides an influential model of planar film style, the different film ‘grammar’ produced by 3D has been explored by Philip Sandifer, who suggests that it is a ‘grammar of allure’ based on momentary visual pleasure, and is thus incompatible with narrative features (2011: 78), an interpretation also offered with subtle variations by William Paul (2004) and John Belton (2012). While no doubt applicable to previous historical periods of 3D production, especially the 1950s, the longevity of the current wave of stereoscopic narrative features suggests that this supposed problem has been surmounted, or at least worked around. Since around 2010, cinemas have been playing new narrative features in 3D on a weekly or fortnightly basis, and it is foreseeable that they will continue to do so. These use the continuity system to depict legible space and direct attention towards story, but also deploy stereoscopic cues. How do the inclusion of z-axis depth, deep screen space and emergence impact upon classical continuity and its contemporary mainstream corollary, intensified continuity (Bordwell 2002)? In short, how are these films negotiating the potential stylistic impasse between classical invisibility and stereoscopic allure? The coexistence of both 3D and 2D screenings of these films suggests that they seek to entertain audiences satisfactorily in either format, something that encourages the perception of stereoscopic exhibition as a bolted-on attraction rather than a holistic element determining overall film style. Under such an arrangement, 3D is founded less on Sandifer’s ‘grammar of allure’ than on the grammar of invisibility identified in classical and intensified continuity. Those aspects of 3D that might be thought of as incompatible, troubling and challenging are tamed to well-established purposes inherited from classical continuity. Bordwell suggests that the pace and variation of contemporary film style is built on a stable framework inherited from earlier systems: ‘the favored technical devices [of Hollywood cinema] have changed, but the spatial system of classical Hollywood continuity remains intact’ (2006, 180). Stereoscopy in narrative features may be understood to be integrated into this system of representing space and narrative in much the same way. 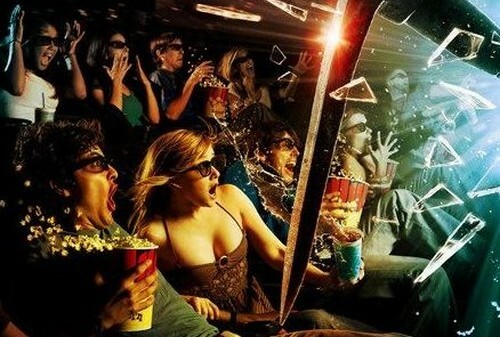 Yet this wholly fails to explain the very different filmic experience provided by 3D. As Miriam Ross has shown, the disappearance of the screen plane in stereoscopic exhibition changes our relationship to the media being presented. While traditional screen images have a ‘structured intelligibility’ and are ‘set apart’ from their audiences, 3D images force an audience to ‘consider and reconfigure [their] bodily placement in relation to the screen content’ (2012: 385-386). 3D is both synonymous with contemporary blockbusters and a mode of exhibiting them that is qualitatively different to the planar alternative. Critical work on the format will therefore need to take into account not only the different ways that stereoscopic films generate meaning, but also the way they negotiate this capacity with established systems of intensified continuity and image composition. Many descriptions of 3D emphasise its tendency towards a style that is antithetical to contemporary Hollywood filmmaking – including longer shot durations, wider framing and the need to allow the eye of the viewer to wander (see for instance Prince, 2012: 209-214). Taking these aspects of the form into account, it is necessary to question how the format functions when it is yoked to the continuity style associated with the narrative feature film, with its faster cuts and careful management of viewer attention. Furthermore, what aesthetic, representational and even ideological consequences may result from the alterations to classical style prompted by 3D? How might these be theorised? If the two formats of 2D and 3D are opposing stylistic poles of film construction, where do they meet? Furthermore, how do they reach an arbitration from which legible, successful films can be made? Attempting to answer these questions provides an opportunity to analyse not just 3D itself, but contemporary film style as well, as the latter navigates a meaningful and legible way of co-existing with the former. Belton, John, (2012) ‘Digital 3D Cinema: Digital Cinema’s Missing Novelty Phase’ in Film History 24.2 pp. 187-195. Bordwell, David, (1985) ‘The Classical Hollywood Style 1917–60’ in David Bordwell, Janet Staiger and Kristin Thompson (eds) The Classical Hollywood Cinema: Film Style and the Mode of Production to 1960. New York: Columbia University Press, pp. 1-84. Bordwell, David, (2002) ‘Intensified Continuity: Visual Style in Contemporary American Film’ in Film Quarterly 55.3, pp. 16-28. Bordwell, David, (2006) The Way Hollywood Tells It: Story and Style in Modern Movies. Berkeley and Los Angeles: University of California Press. Paul, William, (2004), ‘Breaking the Fourth Wall: “Belascoism”, Modernism and a 3-D Kiss Me Kate’ in Film History, 16, pp. 229-242. Prince, Stephen, (2012), Digital Visual Effects in Cinema: The Seduction of Reality. New Brunswick, New Jersey and London: Rutgers University Press, 2012. Ross, Miriam, (2012), ‘The 3-D Aesthetic: Avatar and Hyper-Haptic Visuality’ in Screen 53.4, pp. 381-397. Sandifer, Philip, (2011), ‘Out of the Screen and Into the Theater: 3-D Film as Demo’ in Cinema Journal 50.3, pp. 62-78.